The simple circuit model of the synchronous machine was obtained in Sec. 8.3 by making the assumption that the magnetic circuit of the machine is linear. However, it is known that, under normal operating conditions, the machine operates in a somewhat saturated region. In order to take account of magnetic saturation a procedure for heuristic adjustment of synchronous reactance was suggested so that the simple circuit model could still be used with the reactance parameter X’s (adjusted). While this does give more accurate results for many practical purposes compared to the use of X, (unsaturated), it still does not fully account for magnetic saturation. This proportionality constant* must be found experimentally for a given machine. The armature resistance, Ra, can be easily measured under dc conditions and duly corrected to its ac value and operating temperature; it can even be altogether neglected without any significant loss of accuracy of analysis since its value is only about 0.01 pu as stated already. However, Xi , the leakage reactance of the machine must be determined. This can be calculated from the design parameters of the machine (provided these are known) but only to a low degree of accuracy. Therefore, it is necessary to obtain its actual value by experimental methods. Accurate analysis of the synchronous machine performance can be carried out under any operating conditions provided lc, (Eq. (8.33)) andX/, the leakage reactance are known. Because of the nonlinearity of iron, there are a variety of experimental methods of determining these quantities to high but varying degrees of accuracy. In the Potier method, tests are conducted to determine the following two characteristics with the machines running at synchronous speed. 2. Zero power factor (lagging) characteristic (ZPFC). This is conducted by loading the machine as a generator with pure inductive load* (balanced 3-phase) which is adjusted to draw rated current from the machine while the field current is adjusted to give various values of terminal voltage. Figure 8.19 also shows the ZPFC. However, there is no need for conducting this test fully to determine the ZPFC. All one needs is two points on this characteristic—P corresponding to a field current which gives the rated terminal voltage while the ZPF load is adjusted to draw rated current, and the point P’which corresponds to the short-circuit conditions on the machine ( V, = 0) with the field current adjusted to give rated armature current. 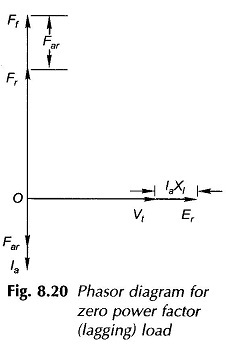 Since the armature resistance is of negligible order, the short-circuit current lags behind the resultant induced emf Er by almost 90°, V, being equal to zero. Therefore, P’ constitutes a point on the ZPFC. It will soon be shown that the complete ZPFC, if required, can be constructed from the knowledge of the points P and P’. With the knowledge of X1 and Ka for the stator windings, the complete phasor diagram of the machine can be constructed corresponding to any operating conditions, generating or motoring. The process is illustrated in Ex. 8.2. In arriving at the algebraic Eqs. (8.37) and (8.38)/(8.39), the armature resis­tance has been neglected. This being a very valid assumption, introduces no error of any significance. If inductors are used for conducting the ZPF test, the power factor is some­what different from zero. It has been assumed that in Fig. 8.19, S’Q’ = SQ = /, (rated) X1 which means that in the ZPF test corresponding to point P and the short-circuit test corre­sponding to point P’, the leakage reactance of the machine is assumed to remain unchanged. This is not altogether correct because the machine excita­tion under short-circuit conditions is OP’ while it is OA for point P (this point on the ZPFC corresponds to rated terminal voltage and rated armature cur­rent). Since OA >> OQ’, point P corresponds to saturated conditions on the machine with a larger leakage flux and hence a larger value of leakage reactance contrary to the assumption made.